So I’ve fallen into another little blogging slump lately because I’m a bridesmaid in THREE weddings this summer! That means pretty much all of my weekends are booked for the next couple months, which is when I normally get most of my posts written. So bear with me as I try to get into a new routine. In the meantime, check out my Jungle Book nail art tutorial that I did at work for Disney Style! I’m pretty much obsessed with the tropical palm leaf trend, so I never wanted to take this manicure off! Hey everybody, I did a thing! I’m so excited to announce that I worked on a collab with Allure to create cover-inspired manicures for their spring reads! I’ll put up a full look at each manicure soon, but check out a peek at what I created! Make sure you head over to Allure to see the full gallery! Happy Reading! I’m not sure how many of you know, but I started my absolute dream job doing social media for Disney Style, Disney’s official lifestyle blog. I get to spend my days on Facebook and Instagram, writing about Winnie the Pooh accessories and nail polish inspired by the Princesses. So of course, Disney nail art comes with the territory. This week, I had the opportunity to help out with a brand new nail art tutorial inspired by one of the biggest movies in theaters right now – Zootopia! Check out the tutorial I filmed for Disney Style, and make sure you follow along/subscribe for even more super fun Disney lifestyle and fashion goodies! I hope you enjoyed this Zootopia nail art tutorial! Happy Reading! 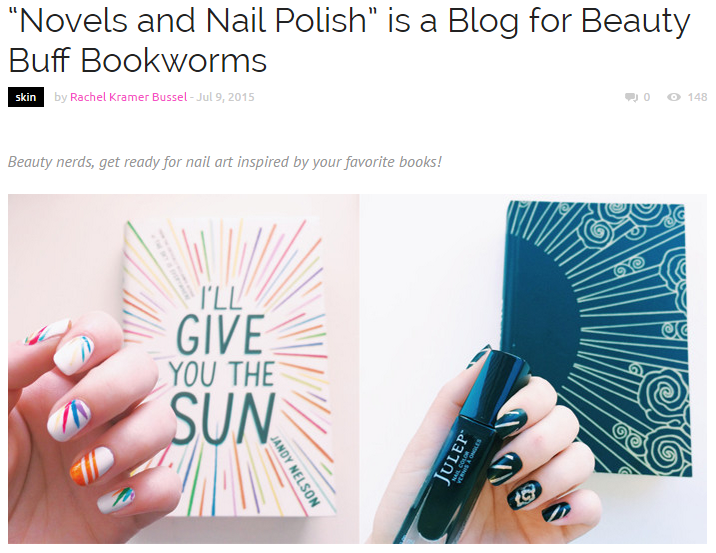 I am so incredibly excited to announce that Novels and Nail Polish is featured in a story on YouBeauty, a fun site dedicated to everything related to living and feeling beautiful! 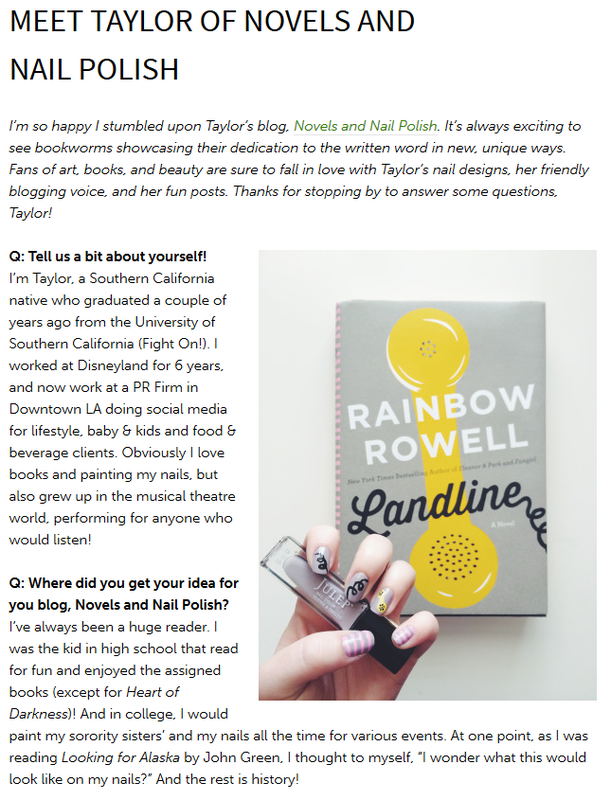 Rachel, a freelance writer, reached out to me about wanting to tell the story of Novels and Nail Polish‘s creative focus. I had a blast answering her questions, but I am completely blown away by the amazing article she wrote and picture she painted of what I do! Go read it! I am so proud of this little blog, and am always completely grateful for all of the support I’ve received from family, friends and the bookish & beauty internet communities! Thank you for joining me on this journey, and I can’t wait for what else is to come! I have exciting news! Novels and Nail Polish has its very first feature! This morning on BiblioSmiles, an adorable blog that is dedicated to sharing the joy books bring to our lives, you can check out an interview with none other than me. Danielle (@DanielleVillano), creator of BiblioSmiles, reached out to me and asked if I would like to tell her readers about my inspiration behind Novels and Nail Polish. Of course I said yes! I’m up for any chance to connect with fellow bookworms. I had such a blast answering questions about how I came up with the idea for the blog, tips on nail art and what fictional character I’d love to have dinner with! Now head over there and take a look! Make sure to check out BiblioSmiles on all of their social media pages: Facebook, Twitter & Instagram (@bibliosmiles)! Happy Reading!